The match-3 puzzle genre requires no introduction as it has captured the imagination of avid mobile game lovers throughout the globe. The success of this genre is primarily due to its simplicity and flexibility. These factors render the match-3 puzzle games quite addictive keeping multitudes of casual mobile game players captivated. What is Lucky Match all about? Lucky Match is one of the best match 3 puzzle games we’ve ever reviewed on Intellectuapp. It is one of those games that combine fun and challenge. Designed with HD colorful graphics, wonderful environments and sweet characters, this game is perfect for Android users of any age. The rules and goals of this game are simple. All you got to do is match at least 3 of the same fruits and collect the jelly. The more you match and collect, the farther on the track you will get. 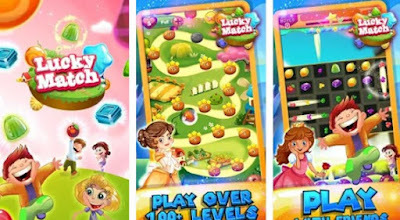 Lucky Match features more than 100 levels that will challenge you to the fullest, various bombs for you to explore jellies and fruits, a global leaderboard for your high scores, etc. Also, you will meet cool characters and play through different amazing places and seasons. Play with friends on your social network and compete to get the highest score, download Lucky Match for free from the following Google Play link.